Preheat oven to 200°C/400°F. Halve Brussels sprouts, cube potatoes, cut red onions into wedges, chop rosemary and parsley, and mince garlic. 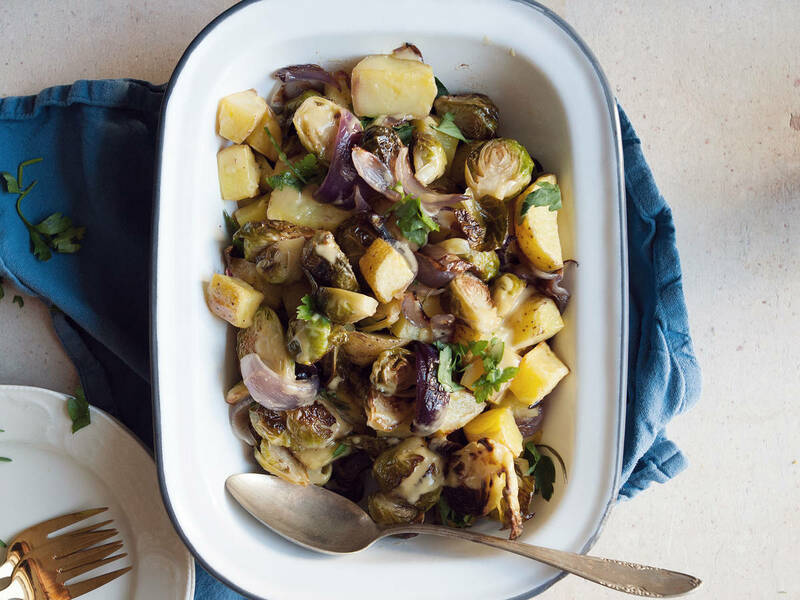 In a large bowl, toss Brussels sprouts, potatoes, onions, and rosemary together with olive oil and salt and pepper to taste. Transfer to an aluminum foil-lined baking sheet in a single layer and roast for approx. 20 – 30 min., or until cooked through and caramelized. Meanwhile, whisk or blend lemon juice, mustard, garlic, and maple syrup until combined. Slowly add olive oil until emulsified. Transfer warm roasted vegetables to serving plate and drizzle with vinaigrette. Garnish with parsley.